It’s starting to feel like this cold weather is never going to end. We know the polar vortex has to subside some time, but until then it’s important not to let it get the best of us. With the freezing temperatures, you vehicle is taking a beating. Freezing cold start ups, salt and sludge build up and ice as far as the eye can see — not fun. The worst is going out to start your car in the morning and not being able to open the door. So, what can you do when you are frozen out of your vehicle? If the ice has sealed around the doors, you have to break the ice first. Lean on the door and push as hard as you can. The pressure might be all you need to crack the ice and break the seal around your door to be able to open it again. If you can’t apply enough pressure to break the ice, try chipping it away. 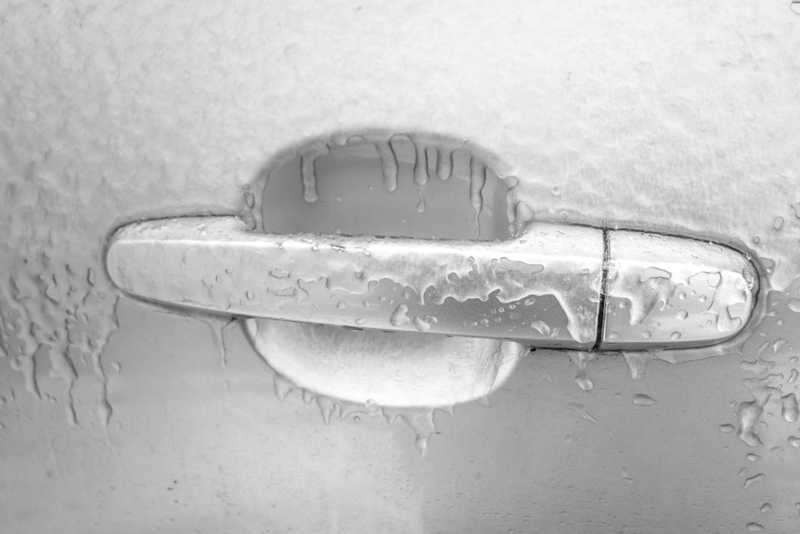 Using your ice scraper (if it isn’t frozen inside your vehicle) or a small hand tool (even a butter knife might do the trick), chip at the ice built up around the edge of the door and the handle. Just be careful not to scratch your paint. If you can’t break the ice, melt it. You can use warm (not hot!) water to thin it to make it easier to scrape or break. As the ice things, break or pull it off piece by piece. Depending on how thick the ice is, you may need to do this a few times. Warm it up even faster with a hair dryer set to the hottest setting. Just plug in, turn on, take aim and watch the magic happen. You won’t even have to break or scrape the ice. If you want, you can purchase a commercial de-icer on your frozen door. De-icers contain chemicals to melt the ice. The thickness of the ice will dictate how much de-icer you need and how long it will take to work, but the average time to melt the ice on a car door is about 10 minutes.